Successfully Added Touchscreen MP4 Player + Video Camera 4GB to your Shopping Cart. 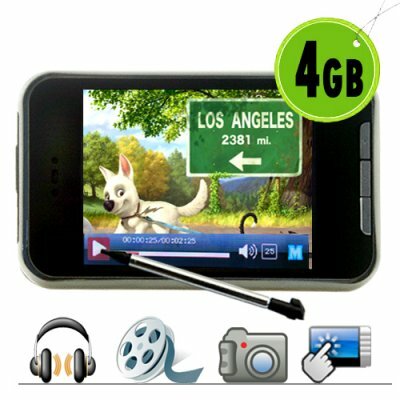 Touchscreen MP4 Player + Video Camera 2GB. New edition MP4 player with all the same excellent features you have come to expect from our digital media players, but now with touchscreen and a built in camera + video recorder. This baby is like your very own personal entertainment center packed into one slick PMP. Touch screen control with the large 2.7 inch TFT LCD makes navigation a breeze, while the big display renders movies into a sharp 320x240 resolution. The high capacity earphone output (with bonus HD earphones) as well as a built in speaker make listening while out on the go a real pleasure. This little PMP is full of the latest features in modern MP4 players while coming to you at a factory direct. A sure fire gift for yourself or the one you love as well as a profitable consumer electronic device for resale. So click "Add to Cart" right now to have us ship a single piece or bulk order of this product to you today! Bonus: Premium quality gold plated earphones now included!. on 2011-10-08 00:11:06 how can i buy??? how can i buy this mp4 ???? I bought one for my daughter and she loves it .Easy to use and with many features. Reciente mente compre producto de alibaba y no sirvio page 55 dollares y ahora me van a rembolsar 10 dollares no compren de ese lugar. yo recomiendo a chinavision personalmente yo tengo mi cuenta con ellos y no he tenido problemas ya he comprado producto y tienen buena calidad. I'm really satisfied with item!!!! !